Allahabad map will assist you in making your way to the popular destinations in Allahabad. Click to go through it. Allahabad, also known by its ancient name Prayag, is the second oldest city in India and is located in the northern state of Uttar Pradesh. Enrooted deep in history, the place has many a mentions in the sacred religious texts on India. It's this history that makes it a tourist's delight with many places to visit; the most famous among them being Sangam. Also known as Triveni Sangam, the site is the confluence of three of the most sacred rivers - Ganga, Yamuna, and Saraswati. 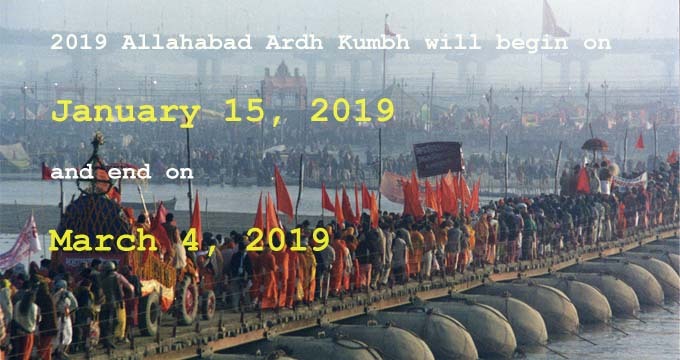 It is near the banks of this convergence that millions gather to be a part of the Kumbh Mela. Apart from hosting the Kumbh Mela (next to be held in 2013), it is also a home to many a monuments and other tourist attractions enriched with history that defines the country of India. When here, during the Kumbh or otherwise, make sure you also visit the attractions like Allahabad Fort, Patalpuri Temple, Asoka Pillar, Akshaya Vat, Hanuman Mandir, Shankar Viman Mandapam, Mankameshwar Temple, Minto Park, Swaraj Bhawan and Anand Bhawan, Jawahar Planetarium, Allahabad Museum, Muir College, Company Bagh, Khusro Bagh, Mayo Memorial Hall etc. Apart from these attractions, which have also been mentioned in brief in one of the sections "Allahabad Tourist Attractions", there are also a few other attractions located around Allahabad that can be visited for their heritage and legacy. Among them, Bhita, an archeological site located on the banks of river Yamuna housing the ruins of an ancient city from 300 BC is definitely a place to be for the history lovers. There is also a place called Jhusi, known for its collection of ashrams and temples. Last but not the least, Kaushambi, one of the greatest Buddhist centers (Lord Buddha is believed to have visited the place twice to deliver discourses), housing an old ruined monastery and an ancient fort; and Shringverpur, a related legend of which tells that Lord Rama stayed here for the night before setting foot into the forest, are also there to make the visit to Allahabad all the more worthwhile. And to make access easy to all these locations, we have provided the map of Allahabad for you that will also help you make your way through the roads, and locate public amenities like Banks, ATMs, and Hospitals etc. Stick to the map and have a wonderful visit to Allahabad and a few attractions around it.